ORC is funded primarily by public and private project grants and contracts, but we also rely significantly on voluntary donations to pursue our mission. We have an excellent track record of success in project funding and now want to step up our other fundraising activities. This open-ended position will be based in the beautiful Berkshire landscape at our Elm Farm site near Newbury. We are looking to appoint an ambitious and enthusiastic Fundraising Officer to work with the CEO to further grow our fundraising programme. You will actively drive new business, including developing a portfolio of up to 150 existing and new donors, prospects, trusts and corporate contacts and develop and implement strategic, creative and bespoke donor plans to inspire, engage and motivate donors. You will have a proven track record of successful fundraising from Trusts and Foundations. Using your exceptional communication and interpersonal skills, you will be able talk to all types of people about our exciting work, to effectively build, nurture and maintain relationships, which will maximise income for the charity and allow us to continue and build the critically important work that we do. It would be great if you had an interest in, and understanding of, organic farming and environmental issues, but if not, we are sure our passionate and dedicated team will be more than willing to provide support and training. If this sounds like you then further details can be downloaded below. Further enquiries to recruitment (at) organicresearchcentre.com Please quote reference SUP1901. We occasionally need creative and motivated volunteer (part-time and home-based) to produce short summaries of web-pages, PDFs, videos, podcasts and online tools for Agricology, a website providing practical information about sustainable farming for UK farmers and growers. More details here. We are full to capacity at the moment but do feel free to register your interest. Environment Jobs lists jobs and volunteering opportunities in this area. Opportunities may exist for MSc and PhD research projects linked to our current research areas. Contact the relevant team leader for further information. 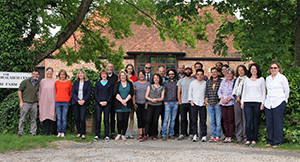 Much of our research involves participatory engagement of producers and other businesses - we currently have over 50 businesses working with us and have now established a Participatory Research Network to develop this work. If you are a producer, processor or other business interested in getting involved with research, please contact the Senior Programme Manager. ORC works collaboratively on projects and in its dissemination of results with a number of UK and European partners. Europe-wide, ORC was a founding member of The European Consortium for Organic Plant Breeding (ECO-PB) – for more information see their website www.ecopb.org. We are members of FQH – the International Research Association for Organic Food Quality and Health. www.organicfqhresearch.org. ORC is also a partner in Organic Centre Wales. ORC works closely with IOTA, who have undertaken collation and analysis of organic research. Reports with practical recommendations for use by advisers and others is available on www.organicadvice.org.uk/res_reviews_public.htm. Organic e-prints provides a fully searchable archive for all organic research. To upload results and search projects Europe wide go to www.orgprints.org.